The many shades of Sunday Riley! Pictures, swatches, color comparisons and more! I’ve reviewed many of my favorite Sunday Riley skincare and makeup products before, and if you haven’t been able to tell I’m a little bit obsessed with her entire line of modern skincare. I’ve been huge fan of her skincare for well over a year now, using her moisturizers and serums religiously. In response to a few questions about the specific shades of the products used in that makeup makeover posting, I wanted supply some pictures for you. Below are some pictures from my makeover wearing the Tinted Primer (medium) all over face, the Creme Radiance Foundation (110W) in T-zone and the Dry Touch Concealer (145W) on various red spots. I really do love the entire Sunday Riley Modern Skincare line, and if anyone is interested in purchasing some of her products, I hope these pictures and descriptions will help you in gauging the different coverages and shades available. A sheer, lightweight primer that smooths the skin and keeps makeup fresh. Sunday Riley Effortless Breathable Tinted Primer prepares the skin for makeup application by effortlessly gliding onto the face to oxygenate, plump and hydrate. Makeup settles perfectly over this silky smooth primer, making it a smooth canvas for foundation, or you may wear it alone. Peptides and sodium hyaluronate leave the skin soft, youthful and incredibly radiant. QUICK TAKE: The Tinted Primer is truly a unique product in the entire cosmetics industry. There is nothing else like it, a must-have for people who like a natural and even-toned glow, instead of a heavy foundation look. It’s oil free, light weight and silky smooth! Just don’t forget to store the bottle upside down or shake it before you pump some out, otherwise the natural and botanical ingredients will begin to separate. As you will see in the pictures below, although the Tinted Primer swatches in Light and Medium have a distinct difference in their shades, once fully blended into the skin the color differences become almost unnoticeable. I can get away with wearing either shade all year round without it altering my skin tone. They really just even out my color rather then change it. A skin-perfecting foundation that’s lightweight and super breathable. Sunday Riley Liquid Light Breathable Perfecting Foundation helps you achieve a flawless, airbrushed look using a luxurious, light-catching formula that disguises fine lines, wrinkles and imperfections. Vitamin C, bamboo and magnola bark work together to plump, smooth and repair the skin, helping it to look its best. QUICK TAKE: Liquid Light is a great foundation that’s very buildable and offers medium to full coverage. I love how truly light and breathable it is, and it’s also excellent for mixing with my other Sunday Riley products, such as Juno and Cashmere SPF 30. When mixed with Juno & Cashmere, I can apply Liquid Light to my entire face with my hands, just like a tinted moisturizer. An ultra-hydrating and smoothing full-coverage foundation cream. 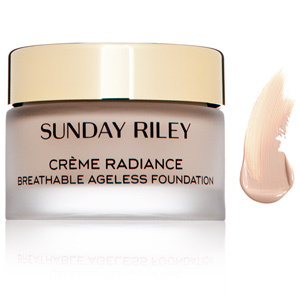 Sunday Riley Creme Radiance Breathable Ageless Foundation is a unique, moisture-rich, complete coverage foundation that allows the skin to breathe and actually correct itself while concealing flaws and imperfections. Infused with magnolia bark, biopeptides, tonka bean and biopeptides, this anti-aging makeup promotes cellular growth, reduces redness and prevents moisture loss. QUICK TAKE: This is a lovely foundation, and it’s surprisingly light for being such a full coverage foundation. It’s a high quality product that’s richly moisturizing, loaded with active anti-aging ingredients and offers a beautiful and very natural finish. I don’t wear this foundation all over my face because I prefer less coverage overall, however I do apply it to my T-zone and it blends perfectly with other makeup. Below are the descriptions for the color shades of Creme Radiance. The same color descriptions can be applied to Liquid Light, but with one exception – I found that the Liquid Light does not have as much ‘yellow undertone’ in the 120 and 130 range. So when reading the descriptions below, replace “yellow” with “neutral” if referring to Liquid Light in the 120-130 ranges. 145W is ideal for dark skin with warm undertones. 145C is ideal for dark skin with cool undertones. 125W is ideal for medium-tan skin with warm undertones. 125C is ideal for medium-tan skin with cool undertones. 105W is ideal for light-fair skin with warm undertones. 105C is ideal for light-fair skin with cool undertones. A lightweight, long-wearing concealer that perfects the skin. Sunday Riley Dry Touch Creme-To-Powder Concealer conceal all imperfections with using a creamy consistency that dries to a flake-free, powdery finish. Formulated to mask all redness, blemishes, acne and scars without looking heavy, this flattering concealer works quickly and lasts all day long. QUICK TAKE: Not the best concealer for around the eyes but excellent for covering up blemishes, red spots or random imperfections. What’s so great about this concealer is the fact that you don’t have to apply additional powder on top of it to set it in. Due to it’s unique cream-to-powder formula, it sets perfectly even when using it ‘on the go’ with just your fingers.